A new trend is emerging in caravan bunks – an evolution from young-kids’ triple bunks to bigger kids’ double bunks. 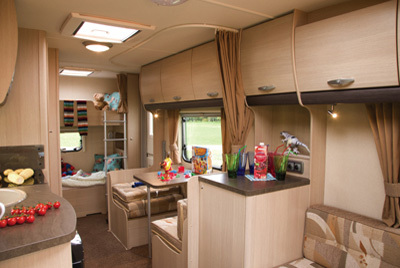 The Europa 570’s young caravanners’ bedroom is across the full width of the rear. Head height in the bunks is generous; the lower bunk, especially, is well up to adult proportions. This is a six berth with a lot of versatility. The dining area forward of the door can be breakfast space, play room – or bunks. The lounge is long enough to make two single beds (as alternative to a double, of course) – so there’s more flexibility here, too. Squashing berths for six into 5.7 metres necessitates some pruning of other aspects of the caravan’s layout, of course. The shower shares its compartment with the toilet. We like the generous capacity of the triple-shelf cupboard that divides the lounge from the nearside two-seater dining area. Kitchen cupboard space, though, isn’t large – but, with the three shelves in this additional cupboard, you’ll find enough places for stuff. 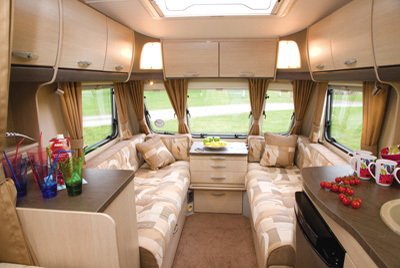 If you’re looking for a six-berth caravan in this size and price bracket, it’s pretty much certain you’ll be looking, also, at the Charisma 565. The two have a lot in common. They also share one thing that’s far from perfect. Both have pull-up bunks making from dining areas. So both have table clips above the bunk assembly that lies against the wall. And both have tables which are too high (or the seating is too low, whichever way you want to see it) for comfortable dining. In the Europa 570, though, the problem is easier to overcome, because the backrests fold out, creating half their depth, for use as the mattress of the upper bunk. So, by day, you can fold out these backrests and place them over the seat bases to increase the height. The 570 has a lot of merits – especially the large storage area under the lower bunk, which folds upwards. And there’s a slim exterior door through which to load. But before you rush into putting your awning in here, remember that awnings can easily weigh 50kg; that weight on the rear of the caravan will make your caravan’s nose weight light – possibly too light, in the interests of stability. That means you have to put heavy items in the front end, under the lounge, to achieve correct balance. As that’s where you’d normally put lightweight items such as duvets, loading suddenly becomes a bit of a challenge. Fixed double bunks make first class sleeping areas for kids and teens. Side dining areas are ideal breakfast rooms and table-top activity areas. In the 570, somehow, the tall dresser unit forms a clear division between the adults’ relaxing lounge area and the kids’ zone. The kitchen is up to its six-person task, the shower’s not as big as some will like (but that’s why campsites have showers). Those keen on caravan security and safety, and looking to get cheaper caravan insurance may wish to invest in the optional lock for the AL-KO Secure receiver (£219.57), tilt sensor alarm (£224.68) and the AL-KO ATC electronic anti snaking device (£444.26). All these devices qualify for caravan insurance discounts through Caravan Guard. 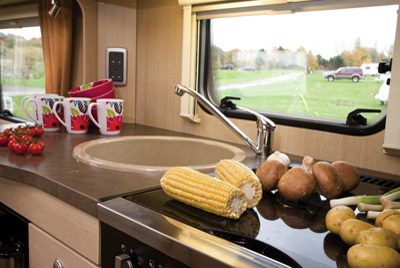 Overall, the 570 is a well-designed, well equipped, solidly-built good choice caravan for four or six people. 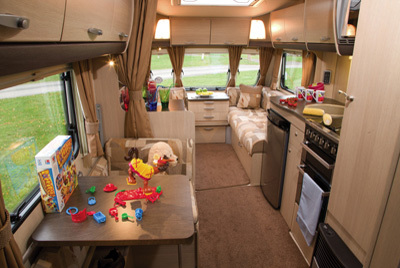 * Caravan insurance premium based on a 2011 Sterling Europa fitted with hitchlock and optional extras: Al-Ko secure, Al-Ko ATC and alarm system. Total value £16,203. 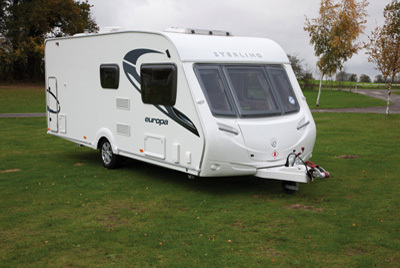 ** Caravan insurance premium based on a 2011 Sterling Europa valued at £15,314, fitted with hitchlock and wheelclamp. Caravan kept on driveway behind 24 hour locked gates at HX4 0BE. Caravanners over 30 years old, 3 years no claims and a member of a caravanning club. Premium includes 10% online discount, 6% Insurance Premium Tax (IPT) and is correct as of 14.07.11.